Granite countertops are a super tough stone that is formed from volcanic magma. Granite countertops have earned a reputation as a great building stone. They ranges in color, but are known for how beautiful they are, especially as a counter top. Granite countertops are beautiful. Each piece is like a unique work of art. Because granite countertops are available in so many colors, homeowners have many options to choose from. Granite counter tops are also very durable and resists heat. This makes it great for kneading dough, making roll out cookies, and other tasks that need a cool countertop. To keep granite countertops clean, use a microfiber cloth to dust off countertop surfaces. Wipe down the granite countertops daily and as needed using water. Once a week wipe down with a damp cloth and a stone cleaner formulated with a neutral pH. Never use harsh chemicals or abrasive cleaners. They can scratch, pit, and etch the surface of the stone. Sealing your granite countertops with quality impregnating sealer will prevent most spills from damaging your investment. We recommend to seal the granite once or twice a year. A 15 YEAR PERFORMANCE WARRANTY is offered for the treated surface when product is applied by an Accredited Applicator following our written instructions and surface is maintained regularly using our written recommended maintenance system. Spills should still be cleaned up immediately to minimize absorption. Unique impregnating sealer technology. Specially engineered molecules penetrate much deeper, and bond permanently inside the sealed material. Lasts many times longer than other sealers and provides unparalelled protection Permanent sealer designed for indoor or outdoor use. 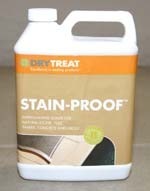 Protects against water and oil-based staining Repels graffiti. Protects from salt attack and freeze thaw damage. Ideal as a wall, counter-top, facade or floor sealer. Engineered for sealing natural stone, paving, tiles, grout and concrete. Sealed areas keep their original appearance, become easier to clean. No special cleaners are required. Standard non-acidic cleaning chemicals will not harm the sealer. STAIN-PROOF Original™ even stands up to commercial cleaning techniques such as high pressure hosing. Maintains slip resistance of the surface. Suitable for homes and large scale commercial applications. Written 15 year performance warranty is available when STAIN-PROOF Original™ is applied by a Dry-Treat Accredited Applicator. STAIN-PROOF Original™ has proven its worth in homes and iconic buildings, malls and monuments all over the world.